Memorial Day brings you a funky parade hat and a handprint flag! Red, White, and Royal Blue construction or scrapbook paper. A star shaped item to trace. I had this little wooded star left over from another project! You could also just print a clip art star from the internet and cut and trace around it. 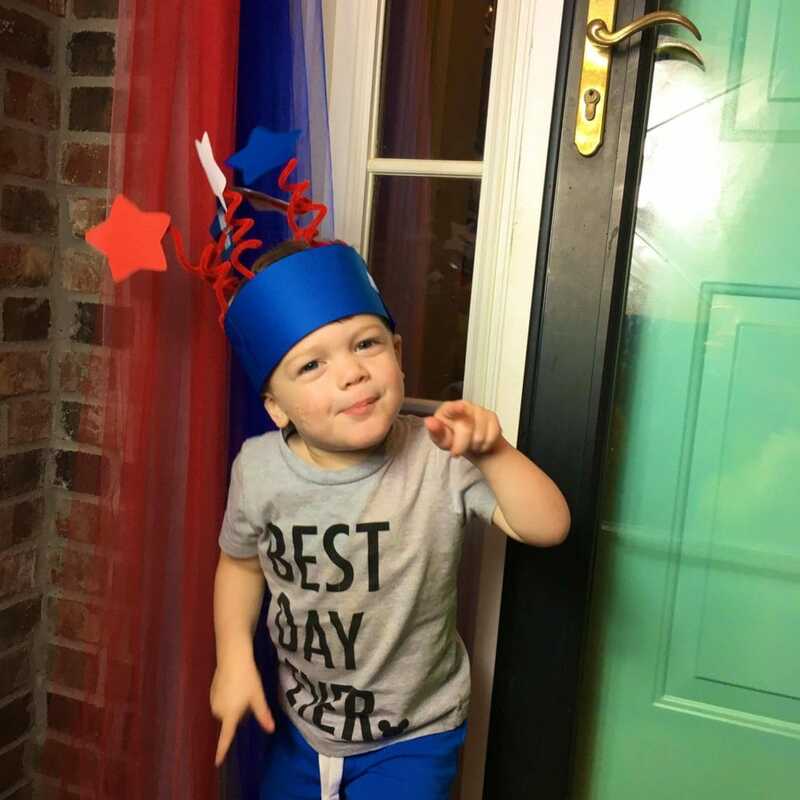 Using a 2 1/2″stripe of blue construction paper measure around your little ones head to make a perfect size. 2. Glue the ends of the paper together where it fits. 3. Trace and cut several stars of each color. 4. Use a red pipe cleaner and twist around your finger making a curly twisted shape. You will then tape your curled pipe cleaner to your stars. And then just simply tape the pipe cleaner to the inside of the royal blue head band. and wallah… you’re all set for the neighborhood Memorial Day Parade…or a family parade down the hallway at 9pm when we should be preparing for bed! hehe – hey, you only live once! How aDOORable is my little stinker? Cut down the sky blue paper so that it fits in the middle of the red paper giving a layering look. 3. Place the hand in the middle on the layered paper for a sweet little flag. Grab your aDOORable kiddos and make some unforgettable family memories. This post is part of the Memorial Day series. Look back at the previous post for an aDOORable and affordable porchscape. And coming up next is the aDOORable Memorial Day Beverage Bar.